This blend of Catarratto, Grillo, Damaschino and Inzolia is made with strictly selected grapes vinified before fermentation is stopped with the addition of eau de vie so sugar levels remain below 40g/L. This “Mistella” is then blended with the best DOC wine and aged at least 2 years in French oak casks. The final wine is fortified to 18% alcohol. With toffee and nutty aromas, this wine has rich dry fruit palate flavors. Passito di Pantelleria Muscat of Alessandria, or Zibibbo, grapes are harvested at the end of August and dried naturally before vinification. The 2007 won awards from IWC and was “Best Fortified Italian Wine” in Decanter. The wine shows complex, elegant dried fruit and apricot aromas with beautiful balance. How to find wines that work great in recipes and in your glass. By Karen MacNeil Marsala's light caramel-like fruitiness is an integral part of Mediterranean sautes, many of which bear the wine's name in their titles. 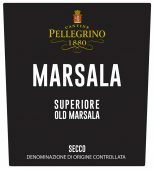 Pellegrino Dry Marsala Superiore is a great choice.